​Welcome back to Hope Springs…beloved teacher Grace Wesley helps students understand and enjoy history. Her love of teaching, her love for her students, and her love of life all come from the same place: her love of Christ. When Brooke, a hurting student grieving the loss of her brother, reaches out to Grace, their conversation leads to Grace sharing the hope she finds in Christ. When Brooke later asks an honest question about Jesus in the classroom, Grace’s reasoned response lands her in big trouble – almost before she even finishes giving her answer. 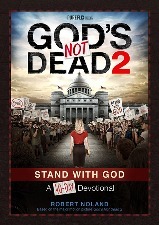 Click Here for more information and additional resources you can use for promotion and follow-up to God's Not Dead 2! 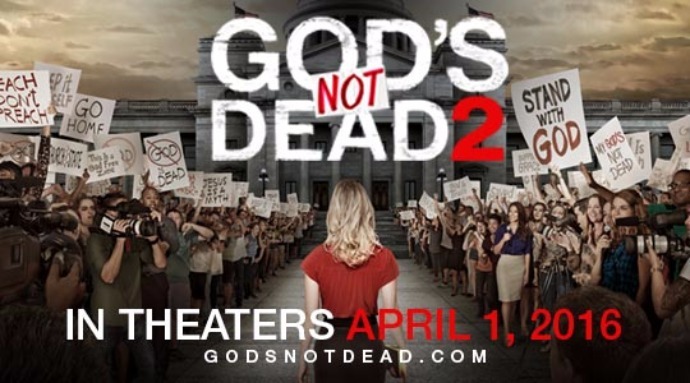 Plan a Sermon Series leading up to the release of God’s Not Dead 2 on April 1, 2016. Follow up with a church family movie night out. Offer four tickets for the price of two to encourage your couples to go on double dates with their unchurched friends. Encourage your high school and college students to enjoy a group outing followed by a discussion about the truth and meaning of Christ’s message. Engage your church to begin promoting God’s Not Dead 2 and use it as an opportunity to share Christ’s message. ​The God’s Not Dead 2 Devotional book digs deeper into the cultural questions of civil disobedience and religious freedom, coupled with the sovereignty of God and the Biblical heroes who have traveled this road before us. This 40-day journey will inspire, motivate, and challenge you to not only grow closer to God, but also deepen your roots to stand strong in the storms that life will surely bring. And once again, we shall see—God is not dead—He’s surely alive! Available at AMAZON click here to order the book.